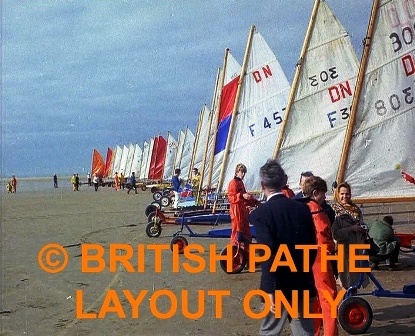 Sand yachting - Lytham St. Annes, Lancashire. Produced by Pathe News, 1969. Long shots of sand yachts lined up at Lytham St. Annes. Long shot of yachts moving across sand. Close up of no.17 and no. 207. Close up of competitor lying down in yacht. moving at speed across beach. Shots of the yachts tacking across beach. Long shot of yacht moving through water on beach. Long shot of two more yachts moving past camera. Several more shots of the race in progress which is won by Mike Benson.